What if, instead of a light rail line, we opted for a Rapid Bus line instead? Rapid buses would be cheaper, right? Construction costs would be lower, and it'd be more flexible in case the city doesn't grow like planners expect it to: after all, bus stations can be moved if they need to, rail is quite a bit tougher to adjust. So, why not bus instead of a rail line? That's a question that Project Connect, a collaboration between the city and Capital Metro, took some time to tackle in the development of the transit system proposal they've come up with. "The answer is, yes, we could do this 9.5 miles," says Kyle Keahey, the rail lead for Project Connect. "But we would use up about 80 percent of the capacity of that single investment with this one project. And that's because buses can only carry so many people, you can only move so many buses through the system." What Project Connect found through their analysis is that, sure, rapid buses would be cheaper than rail at the outset. But they can't move as many people as rail can if a larger system is eventually built. And one day the demand will be great enough that those rapid buses would be maxed out. So if you're going to build a large system that can carry a lot of riders, you'd best consider rail. Project Connect also noted during its analysis that rapid bus service is "often perceived as less predictable, permanent, or desirable." Not everyone agrees with Project Connect's analysis, however. "I want rail," says Jace Deloney, Vice Chair of Austin's Urban Transportation Commission and a founder of the grassroots group AURA, a pro-transit organization that is opposed to the rail and roads proposition. "I think all of AURA would like to see rail, and a lot of the people within our loose community want rail. I think it really comes down to, where does rail make the most sense? It makes the most sense wherever it's cheaper to run than existing bus service." While the question of cost has focused on how much it will take to build the rail line, there's the big question of how much it will take to operate it: rail has high operating costs, so it needs lots of riders. Will the area around Highland Mall really grow enough to support a light rail line there? The rail project's planners are betting it will. "There's a lot of new ridership that's clearly coming," says Greg Hartman, President of External Affairs at Seton Health and treasurer for Let's Go Austin, a political action committee pushing to pass the proposal. "You can see, with the medical school, the ACC Highland campus, other things going on, there's a lot of new ridership and new opportunity [in that area]." Hartman also served on the Central Corridor Advisory Group, a collection of officials and business and civic leaders that advised Project Connect during the planning process. Others are more skeptical that the Highland area will see such growth. "I've seen the figure of something like 17 Austonian condominiums worth of growth that's going to happen between now and 2030," says Lyndon Henry, transportation planner in Austin who is organizing against the current plan as part of the grassroots group Our Rail. Henry says if the light rail line doesn't have lots of paying customers, the high cost of operating it could force cuts to existing bus service and prevent the rail system from being expanded. That's exactly what happened with the MetroRail commuter line that goes from downtown to Leander. Henry maintains the growth projections for the area around Highland Mall are "pretty unrealistic." "Maybe an asteroid will drop and people will come out of it and populate this place, but basically, it's highly unlikely that we're going to see that kind of growth," he says. And this is what the rail versus rapid bus question comes down to, in a way: it's a bet. One side is betting that the area around Highland Mall will have enough growth to support the high operating costs of a rail line. The other is saying they're not so sure, and rapid bus in that corridor is a safer move. 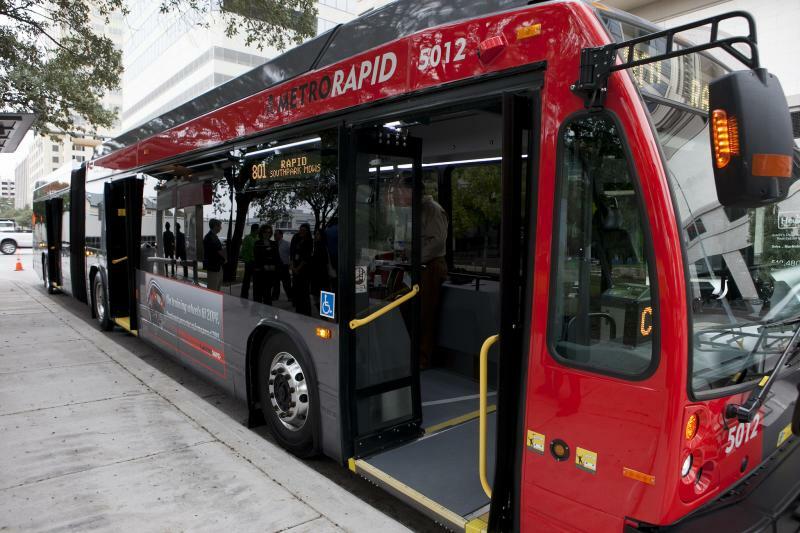 The Urban Transportation Commission passed a resolution this summer asking the city council to consider rapid bus as a final option instead of light rail. A similar 'Rapid Bus Plan B' proposal has been put forth by AURA. The viability of the rapid bus option in case the light rail proposal fails has also been noted by the current chair of Capital Metro, Austin City Council Member Mike Martinez, who's also running for mayor and is a big supporter of the light rail plan. At a recent KUT forum, he was asked what happens for transit in Austin if the light rail plan fails. "If it fails on [November] 4th, on the 5th we have to go right back to work dealing with the gridlock and congestion that we face," Martinez said. "We go back to adding bus rapid transit lines. And we go back to work on our road infrastructure." The two existing rapid bus lines in Austin are on the two corridors with some of the highest transit ridership in the city. Both came online this year. The city has already studied a third possible rapid bus line in Austin, and it overlaps quite a bit with the proposed light rail line, particularly along East Riverside. "So we had looked at that as a possible MetroRapid corridor as far back as the mid-2000s. With the emergence of the urban rail there, it wouldn't make sense to have both. So we kind of put that on the backburner," said Todd Hemingson, Vice President of Planning with Capital Metro. While rapid buses aren't the shiny objects that new light rail lines are, they are proving to be a successful and attractive alternative in some cities. In Mexico City, for example, rapid buses are carrying over 800,000 passengers a day, nearly the size of the population of Austin. Of the dozens of transit projects in line for matching federal funding in the U.S., a third of them are bus rapid transit (BRT) projects. One big factor in the success of BRT in Mexico City and other cities? They took away traffic lanes from cars and dedicated them to mass transit, something Austin has been reluctant to do for either rapid buses or rail.